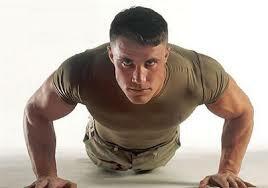 Push ups are one of those exercises that get dismissed quite easily in many weight control programs. Is it because of their simplicity? Are they not rated that highly by health professionals because of all the new shiny equipment in posh gyms these days that on the face of it seem to get better results? My honest opinion, it is one of the best exercises you could have in your exercise armoury. The answer is quite simple, they are simple exercises to perform, and what I mean by that is you don’t have to figure out what this machine does, how the pulleys work, what does this clip or handle do? They are safe. The only equipment you need is the floor, and floors are everywhere! No equipment or heavy weights have to be carried around, no work bench needed, just a floor and you. This also means you don’t need a gym, and all that goes with having to go to a gym, expense, time etc. The push up is a versatile exercise, it doesn’t matter what your level of fitness is, there is a variation for you. You can build from never having done one before to progressing through the variations of the exercise and eventually banging out some plyometric push ups. The push up enables you to build functional strength as it uses a lot of major muscles at the same time, in unison. When you perform a full push up, you not only work your chest, shoulders and triceps, but your back, abs and legs have to work isometrically to stabalize your body. Hence it is a full body workout. The British military, as well as others do push ups as a staple. They can’t all be wrong! If you can’t hold your weight in a plank position just yet, you can place your knees on the floor to take the pressure off until you gain strength. You can perform full push ups with correct form and lowering all the way down, now it’s about adding more sets/reps to push you a little more. You can do a lot of sets or reps with relative ease, maybe try some declines by placing your feet on a small wall or the sofa for example. Alternatively you can try some lung busting plyometric push ups. So get down and give me twenty.